If the RNA polymerase attaches to the promoter region of the gene, would it form the initial mRNA portion soon after attachment by reading the promoter region? Or should it slide across the DNA then form the initial mRNA portion? Also, does the RNA polymerase read DNA base pairs one by one and add the RNA base pairs to the chain one by one? Or, does it read groups of base pairs just like tRNA which reads triplet of bases during translation? 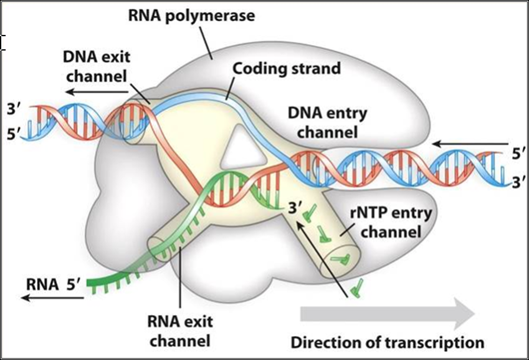 Similarly, is the terminator region transcribed too and then the process of transcription ends, or does the process end immediately after the RNA polymerase reaches the terminator region? How does the process end just by reading the terminator region? So, should the promoter and terminator region of a gene be considered parts of the gene or separate entities? would it form the initial mRNA portion soon after attachment by reading the promoter region? The RNA Polymerase binds to the promoter, however since it is so large the front end of it hangs off the end of the promoter. When Transcription begins the promoter is not included, as the transcription process occurs at the front of the polymerase. Also, does the RNA polymerase read DNA base pairs one by one and add the RNA base pairs to the chain one by one? The RNA polymerase adds nucleoside triphosphate (NTP) one by one. As the picture shows below, there is only room for one NTP in the active site and once the correct NTP is placed it is added to the RNA chain. How does the process end just by reading the terminator region? The question of termination is dependent on the cell. Prokaryotes terminate in either a Rho independent or dependent process. Independently, a hairpin occurs in the RNA that breaks off the transcript, dependently, a Rho factor binds that causes termination. Eukaryotes are less well known, but it is generally believed that after the poly-A site there are also factors that bind and induce termination. This question is slightly more about definitions that biology. The Oxford Engligh dictionary defines a gene as "The basic unit of heredity in living organisms". Since the promoter, non-coding, and non-translating regions are still paramount in getting the protein made, I would argue that they are still part of the gene and the larger hereditary unit. Not the answer you're looking for? Browse other questions tagged genetics molecular-genetics gene or ask your own question.